Incorporated in 1986, the Live Oak Art Center (LOAC) is an independent nonprofit organization that showcases innovative contemporary art in the 1891 Brunson Building in Columbus, Texas’ Historic District. Our mission is to promote the visual arts by presenting exhibitions, developing educational programs and providing an environment for creative expression. The Live Oak Art Center is the only visual arts organization in Columbus with a permanent location, a rotating exhibition schedule with free admission at all times and a professional full-time staff. Executive Art Director Shawn Roberts brings contemporary and traditional art from all over the state in approximately 10 exhibitions a year, featuring the work of both emerging and established artists. 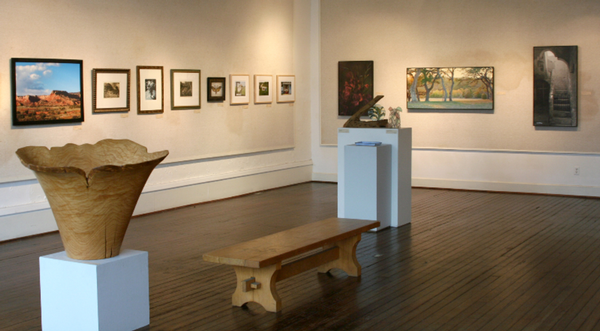 The Live Oak Art Center brings together a community of people interested in art and history. LOAC is always free and open to the public. Founded in 1954, offering year-round exhibitions, workshops, publications, outreach programs, lectures, classes, and home to an on-site library housing books on art & photography.